Join us on Thursday, April 20 at 12:30 p.m. when Judith Swain will take the mystery out of bargello. These quilts look impressively complicated, but once you understand the concept and know a few tricks, you’ll be on your way to making a beautiful quilt, table runner, or set of placemats. The students pictured here took Judith's bargello class last week and made beautiful round quilt tops. Third Thursday demos are always free and last 20-30 minutes. No RSVP required. A&L Quilt Group: Thursday, April 20, 1 p.m. The growing A&L (art and landscape) Quilt Group meets regularly on the Third Thursday of each month at 1 p.m. at Cortez Quilt Company. Bring your Show & Tell, exchange ideas, and give and receive inspiration. No RSVP necessary. This meeting usually lasts about an hour. Here is the first clue for our original mystery quilt - Mystery in the Southwest: A Three-Fabric Throw. The quilt uses a total of 4 3/8 yards of fabric (not including backing), finishes at 53" x 53", and is suitable for confident beginner quilters and above. Click here to download a printable PDF that includes fabric requirement and suggestions, cutting instructions for the project, and the first sewing clue. Next week . . . Clue #2 (there are five total). Stay tuned. 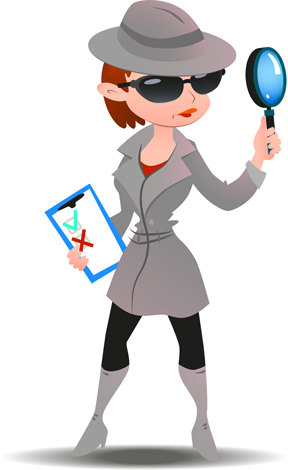 We'll have a contest before the last clue to challenge you to solve the mystery before seeing the final layout. 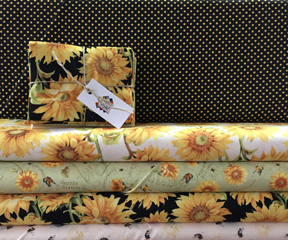 We received several new collections last week, including this beautiful sunflower themed one. Jelly rolls and charm packs are available to go with this fabric. 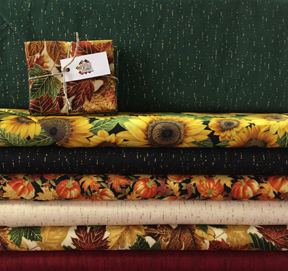 Thinking ahead to fall, this fabric will make a beautiful quilt. It has just a tiny glimmer of gold to add elegance. Coffee, anyone? 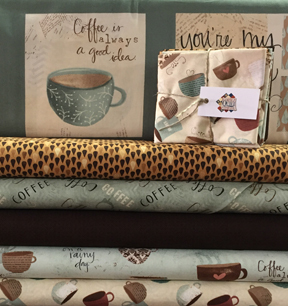 This softly colored collection includes charm packs and jelly rolls. Free patterns are available with purchase of fabric. Calling all art and landscape quilters . . . these ombre batiks belong in your stash! P. S. We now have these patterns for all 12 months in stock. Each pattern includes custom buttons. This Michelle Watts pattern has been a best-seller at our shop for years. Make a beautiful 23″ x 41″ butterfly wall hanging in this full-day class taught by Karen Childress. Choose a variety of fabrics to match your decor – subtle earth tones as shown here or bright and bold. 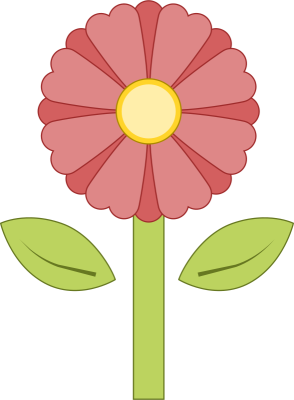 This is an excellent class if you are interested in learning how to do raw edge applique. 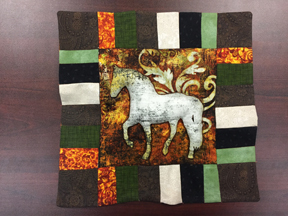 Learn to use a panel, piece a border, and make the horse you choose puffy and realistic looking. Add a handle to finish into a wall hanging. Aimee King will teach. In this class students will make something special for Mom. We're not saying exactly what because it should be a surprise! Aimee King will teach this class. In this class you will learn to cast on, knit and purl, bind off, and start working on a basic ribbed scarf. You may choose to learn continental (“picking”) style or English (“throwing”) style. A pair of knitting needles and ball of yarn are included in the class fee. Limited to four students; youth and adults welcome. Sue Maxwell will teach this class. 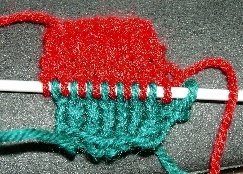 Learn to knit two-layer fabric with two different yarns. 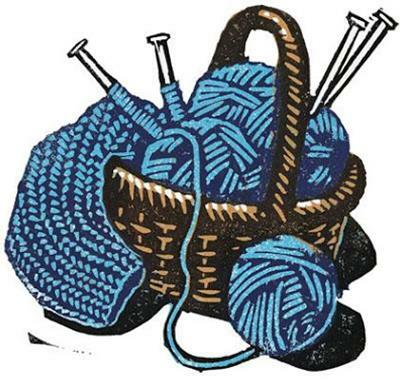 Bring DK or worsted weight yarn in two colors and appropriate-sized needles to class. For intermediate knitters. We're now taking RSVPs for our Quilt Sampler magazine celebration. 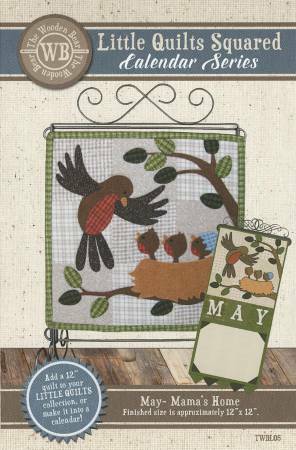 Join us on Friday, May 12 at 6:00 p.m. to see the Cortez Quilt Company featured quilt, pick up your copy of the magazine, purchase quilt kits, and enjoy the company of fellow quilt enthusiasts. Please click here to email us with your RSVP, or call 970-565-7541. 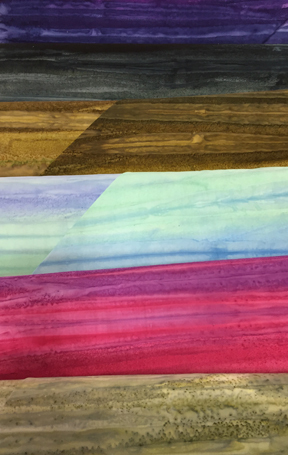 Join us for a Sunday afternoon workshop with guest educator Shanna Stordahl and learn to machine quilt using acrylic rulers and a unique presser foot. 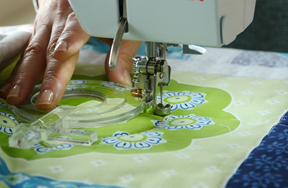 With this technique you can make beautiful, symmetrical designs on your quilts. Participants will use BERNINA 7 and 8 series machines as well as the Q20 sit-down long arm. 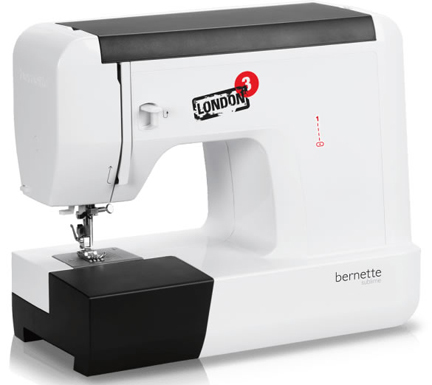 BERNINA is coming out with a new line of bernette machines this summer, so we are putting the current models that we have in stock on clearance. The London 3 features easy stitch selection, needle threader, recessed handwheel, and flip-top lid dust cover. Suggested retail on this machine is $399, our everyday price is $299, and you can take home a London 3 now for only $249. This machine would make a great graduation gift! Limited to stock on hand. This week only . . . take 20% off a Tutto sewing machine case. These come in black, red, purple, lime green, and turquoise. Sized to fit your machine, these bags feature lots of pockets for storage of machine accessories and they roll like a dream. Offer expires on Saturday, April 22nd at 6 p.m. Phone orders welcome. You must mention that you saw this offer in the Quiltzette to receive the discount.